The original Hasselblad X1D flopped in reviews and at the box office, so I was wondering if we will ever see a successor. Luckily, as spotted by mirrrorlessrumors, the Hasselblad X1D MK II has been officially registered. Mirrorlessrumors thinks it will feature the same 100 megapixel sensor of the Fujifilm GFX100. Hasselblad X1D, Any Chance against Fujifilm GFX? The Fujifilm GFX system dominated the medium format market overnight, thanks to an attractive price (for medium format standards) and a solid performance, unlike the Hasselblad X1D, a stylish, but buggy and slow camera (overheating, 7 seconds start-up time etc.). Hasselblad tried to address some issues via firmware update, but it’s clear that only the Hasselblad X1D MK II can really introduce those improvements needed to make it a proper performer. 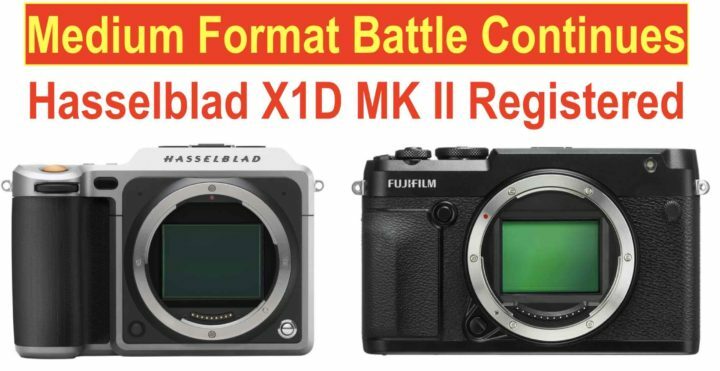 I doubt, though, the Hasselblad X1D MK II will have an aggressive pricing, like the Fujifilm GFX. In fact, Hasselblad has only one mirrorless camera line (the X1D) and development costs must be very high, whereas Fujifilm shares the R&D costs for the GFX with its APS-C system. Hence, new features and software enhancement introduced to the X system, can be simply taken over to the Fujifilm GFX. This is why I believe Fujifilm will always have substantial price advantage over Hasselblad. And Hasselblad should definitely stick a proper mechanical shutter into the Hasselblad X1D MK II. I mean, just check out here in our GFX group, how extremely popular the use of old full frame and medium format glass on the Fujifilm GFX is. The mechanical shutter opens up lots of possibilites to experiment, try, test… or, in other words, have fun with third party glass. But we will see. Maybe the X1D MK II will have a global shutter ;).